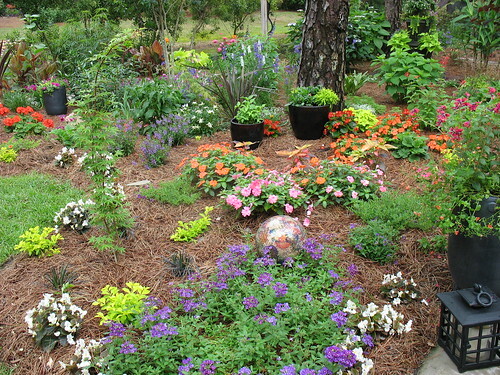 This garden of mine has been a labor of love for many years here on Hilton Head Island. Tranquility and peace, is what you will find. Walk through the meandering paths and enjoy all the beauty of colorful flowers, the sound of fountains, and a small peaceful lagoon. My back yard is a place to sit, relax and commune with nature. Around every corner is a creative surprise. The plants are an unusual combination of textures, colors and types. Many of my garden accessories are hand crafted such as stacking flower pots in unique ways to create a birdbath or planter. In the shadows fairies, gnomes and friends live in woodland towers. It’s not a large yard, but it provides endless days and evenings of pleasure throughout the entire year!